The World's Great Prototyping Product | Schmartboard, Inc.
Prototyping Boards: Schmartboard makes it quicker and easier to get from the idea to the finished circuit, because only with SchmartBoard, anyone can hand solder SOIC, QFP, PLCC, QFN, and discrete surface mount components. In fact, with SchmartBoard hand soldering surface mount components is even easier than hand soldering through hole. Instead of denying yourself the most current chip technology or paying a fortune for prototyping, you can now use today’s most advanced chip technologies in your prototype circuits. Because SchmartBoard|ez makes hand soldering SMT parts fast, easy and flawless, your time is not wasted waiting for someone to populate your custom PCB for testing and money is saved in the development of your project. 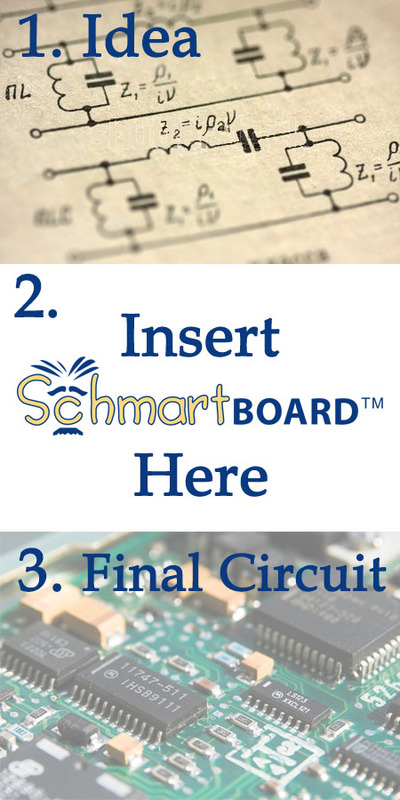 Get from your concept to final printed circuit board quicker than ever with Schmartboard. Wire Jumpers: Schmartboard Jumpers are of the highest quality available. You will find that the male and female receptacles on Schmartboard jumpers are thinner than most on the market which allow you to work better and easier in tight areas. Our Female receptacles fit snugly on .1” headers. The Male receptacles work great with both breadboards as well as PCBs. We challenge you to compare ours head to head with others because we know you will immediately understand the difference. Cable Design and Fabrication: Schmartboard off the shelf jumpers are the best on the market. The female receptacles are snug and the wire is well made. We therefore get requests for custom jumpers and other types of cable assemblies all the time. Kitting Services for Educational Institutions: Schmartboard works with many education institutions in the creation of new tools or for simply kitting our products together with other items such as soldering irons or components for the benefit of students.